The movie opens with a view of Fort Detroit, manned by British and Hessian soldiers. The Ottawa tribe lived near Fort Detroit and in 1763 were led by Chief Pontiac (Lon Chaney) in an uprising against the British. Pontiac had believed the Ottawa could live with the whites but a Hessian officer, Col. von Weber, attacked the Ottawas, slaughtering woman and children. The Ottawas want war with the British. They are allying themselves with the French. British general Jeffrey Amherst congratulates von Weber on his methods. A ranger, Lt. Kent McIntire (Lex Baxter) tells Amherst that von Weber must stop the slaughter. McIntire tells Amherst that Pontiac has declared war and he will not spare anyone because von Webber did not. Amherst, however, refuses to stop in von Weber and orders him to take command of Ft. Detroit in place of Maj. Gladwin, who was sympathetic to the Indians. McIntire talks to a white captive, Winifred Lancaster, who is a captive of Hawkbill. Hawkbill then captures McIntire and takes him to Pontiac who is his friend. Kent tells Pontiac about the Hessians coming in. He warns Pontiac that more and more are coming. He tells Pontiac that he should talk to major Gladwin, and Pontiac agrees. Hawkbill tries to claim Winifred. He boasts and dances in front of her (in an embarrassingly bad scene). Kent tells Hawkbill that Winifred is his woman. Pontiac agrees and gives Winifred to Kent. Gladwin tells Kent that von Webber had been captured and tortured by the Arapahos and hates all Indians. Gladwin is anxious to see Pontiac, but when von Webber shows up he refuses to try to reach an agreement with Pontiac. He instead sends blankets infested with smallpox and plans to attack Pontiac's village once the disease sets in. Kent is then arrested by von Webber, but Gladwin helps him to escape. Kent and Hawkbill then get in to the obligatory knife fight, which the white guy always wins. The Ottawa get sick and Kent and Winifred leave the Ottawa and return to the fort after von Webber has left. Gladwin wants Kent to go warn von Webber about Pontiac returning to the warpath. When Kent catches up to von Webber he is already under attack by Pontiac, and he shoots and wounds Kent. Pontiac wipes out the soldiers and captures von Webber. They then tie von Webber to a post and covers him in the disease covered blanket. In time von Webber gets sick and dies. 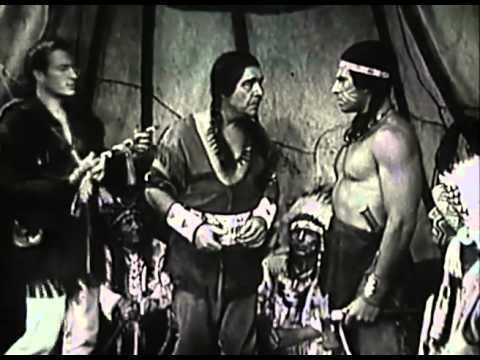 Gladwin and Winifred then ride to the village bearing a white flag, and Pontiac agrees to consider peace, although he says Great Spirit has toldd him that all Indians will disappear as the whites keep coming. As Gladwin and Pontiac smoke a peace pipe, Winifred embraces the wounded Kent. A pretty good movie about actual events (although the Hessians weren't in America at this time). It was very sympathetic to the Ottawas who were used and abused by the British. It was a little sad to see Pontiac decide to go down without a fight even though he could foresee the end of his people.